Larsen and Toubro - built Offshore Patrol Vessel ICGS Vikram was commissioned into the Indian Coast Guard today in the august presence of Hon'ble Raksha Rajya Mantri Dr. Subhash Bhamre, at L&T's Defence shipyard at Kattupalli, near Chennai. The vessel is the 'First of Class' of seven new generation Offshore Patrol Vessels (OPVs) contracted by Ministry of Defence (MoD) to L&T in March 2015, under government's initiative of 'Make in India'. DG Rajendra Singh, PTM, TM, Director General of Indian Coast Guard, IG Rajan Bargotra, TM, Commander Coast Guard Region (East), Mr. S.N. Subrahmanyan, CEO & MD, Larsen & Toubro, Mr. J.D. Patil, Whole-time Director (Defence) and Member of L&T Board, Vice Admiral (Retd) B. Kannan, MD & CEO L&T Shipbuilding, and other dignitaries graced the occasion. The defence ship, after its keel was laid in March 2016, was completed in just 25 months of build period including trials and commissioning. The commissioning of the indigenously designed and built ICGS Vikram has rendered a befitting curtain-raiser to the "Make in India" theme of the DEFEXPO, which is being organised in Chennai. Commenting on the commissioning, Mr. S.N. Subrahmanyan, CEO & MD, Larsen & Toubro, said: "It is a momentous occasion for L&T to become the first private Indian shipyard to deliver an in-house designed Offshore Patrol Vessel to MoD. L&T Shipyards have achieved unmatched stellar delivery performance in prestigious MoD contracts for 54 Interceptor Boats for Coast Guard, Floating Dock project for Navy and now the OPV for Coast Guard. This bears testimony to our capabilities and commitment towards "Make in India". Over the past decade, we have invested heavily in building state-of-the-art facilities and talent pool for Defence manufacturing and are fully geared up with sufficient capacity and financial strength to grow multifold in this sector in coming years." "Given the opportunity and level playing field, L&T can provide the much needed impetus to the augmentation of Indian Naval and Coast Guard fleets through in-house design and timely delivery of vessels." Mr. Subrahmanyan added. The OPV project has scored many firsts in India's nearly six decades of Defence Shipbuilding history. The entire design and construction of OPVs has been carried out inhouse by a private sector shipyard – L&T Shipyard. ICGS Vikram class OPVs are long-range surface ships, capable of operation in maritime zones of India, including island territories and equipped to handle helicopter operations. 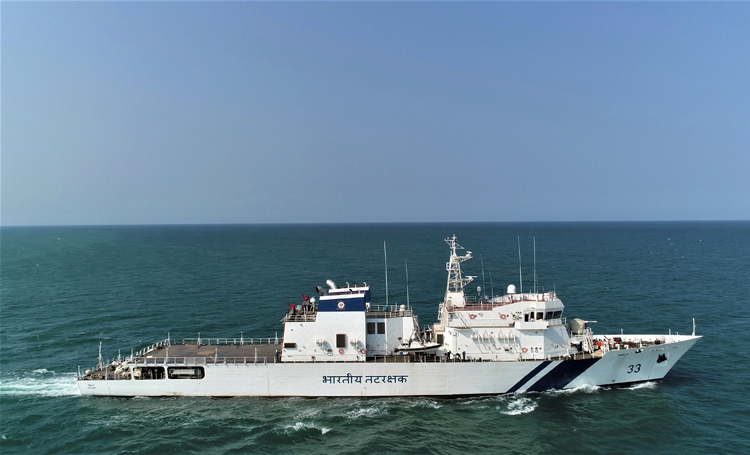 The role of an OPV is to conduct coastal and offshore patrolling, policing maritime zones of India, control & surveillance, anti-smuggling & anti-piracy operations with limited wartime roles. Mr. Jayant Patil, Whole-time Director (Defence) and Member of L&T Board, said: "L&T defence shipbuilding capabilities have come of age with over two decades of rich experience in design, engineering and construction of complex defence platforms and three decades of track record in platform specific equipment and systems. On-time commissioning of first of the class OPV ICGS Vikram underlines excellent design and execution capabilities of L&T. In the past one year, 11 new build platforms were launched / delivered by L&T, all ahead or on schedule. Today, L&T is uniquely placed to address complete value chain of Defence Shipbuilding from design to manufacturing of critical ship equipment, modular construction and through life support." The vessel, which is approximately 97m long, 15m wide, has 3.6m draught, 2140 T displacement and a range of 5,000 NM. It can attain a sustained speed of up to 26 knots. The OPVs are built with Integrated Platform Management System to enable special control capabilities generally integrated in larger warships like Frigates and Destroyers. The vessels are fitted with front propulsion pods for providing an ability of high manoeuvrability. The entire design and construction process has been certified by American Bureau of Shipping as well as Indian Registrar of Shipping and overseen by the Indian Coast Guard's resident team at Kattupalli. Further the harbour and sea trials have been undertaken by the crew of ICGS Vikram. Vice Admiral (Retd. ), B Kannan, MD & CEO L&T Shipbuilding elaborated: "Achieving ahead of time delivery for a First of Class called for adoption of modular construction, meticulous planning and deployment of efficiency enabling Digital Technologies. The experienced workforce of L&T along with its vibrant project management skills achieved a high concurrency between design and production, which enabled realization of an unmatched build period of 25 months from keel laying to delivery; which is expected to be further reduced in the subsequent follow on OPVs." Commissioning of ICGS Vikram has come in quick succession to handing over of another major vessel Floating Dock (FDN-2) in March 2018 to the Indian Navy for deployment at Port Blair. Out of 54 Interceptor Boats ordered by Indian Coast Guard, L&T has already delivered 38 boats up to two years ahead of schedule and has completed the construction of remaining 16 boats. All these vessels were Indigenously Designed, Developed and Manufactured (IDDM), promoting 'Make In India'.